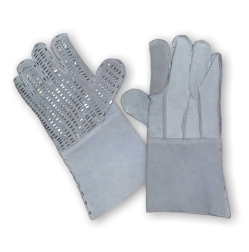 Barbed Wire gloves are generally used in military to place barbed wire on country Border or restricted area to safe the illegal entrance. By the use of iron wire stapling, it becomes more safe for hand. o 100% Genuine Leather Made. o Stappeled with Iron Wire.